easyJet will be cutting 20% of the airlines' flights out of London Luton airport and will be closing the East Midlands airport hub by 2010. This is following Ryanair's changes (and cuts) in their flight schedule as budget airlines are trying to bolster their bottom line in a very difficult climate for airlines. easyJet plans to move flights from Luton to other airports, which are apparently more profitable. In other words, they're cutting flights that are too cheap to travel on to increase ticket prices elsewhere. 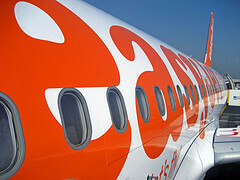 At the moment, easyJet flies 16 airplanes from Luton and carries 4.7 million passengers each year. Out of East Midlands, the airline flies 3 planes and 700,000 passengers. It's turning out to be quite a poor year for budget travelers in Europe, with the 2 main budget airlines cutting routes and Sky Europe going bankrupt on 1 September. Are you being affected by route changes or airline bankruptcies? Let us know in the comments. Last updated by jack on 03 September, 2009 in Travel News.